The average sales team spends only ⅓ of their working day actually talking to prospects. Seem wasteful? It is. If you run a business, or a sales team, increasing the effectiveness and efficiency of a sales team is always going to be your top priority. An inefficient sales team is a waste of your time and your money. I have worked in sales for over 16 years, mostly with startups and SMEs, and I want to share a little of what I have learned about sales structure with you. Though it sounds so fundamental, in my experience, structuring your team for efficiency and productivity can be a deciding factor in whether your startup makes the 20-month mark. I am going to run through why and how you should split your sales team to maximise efficiency and productivity, and how to further compartmentalise your team into 4 key roles. In the B2B world, it can sometimes seem impossible to separate lead generation and sales. Many sales teams are expected not only to close the sale, but to find their own leads too, and in some cases even manage accounts. Ever heard of a guy called Vilfredo Pareto? Other than having a fantastic first name, Vilfredo was the Italian economist behind the Pareto Principle, more commonly known as the 80/20 rule. Way back in 1896, Vilfredo noticed that about 20% of the peapods he was growing in his garden contained 80% of the peas. Now we have all seen this applied to sales before. 80% of your sales are generated by 20% of your sales reps is frequently commented on. But, the same rule applies to how your sales team is spending their time. 80% of their time spent prospecting and researching for just 20% of their time spent engaging and convincing prospects just is not efficient. In order to get the most out of your sales team, you need to let them do exactly that: sell. It is important to focus your strategies around that goal. In reality, a sales team is fundamentally composed of two different jobs — lead generation and selling. In most companies, reps are still stretching themselves across both roles. This is a classic case of spreading your team too thin. To streamline your sales processes, split your team by role, according to skillset. Get the right people working on the jobs they are good at. I’ll now break down how to make that distinction between lead generator and salesperson. When allowed to focus on just sales, your team of salespeople begin to excel at communicating your products or services, and your company generates revenue. While these qualities can make the perfect salesperson, you must ask yourself: are these also the qualities of a team member who should be reaching out to new leads and potential customers? Prospecting is a different skill set — one with very different requirements to closing a deal. According to a study by Hubspot, most salespeople agree that prospecting is the hardest part of their job. When surveyed about the elements of their role they struggle with most, 21% said it was identifying leads, 38% it was prospecting and 13% said it was qualifying leads. Is it time to let your sales team do what they do best, and consider bringing in lead generators instead? Finding fresh leads for your business and enriching those which you have already found is key to growth. Lead generators are the people who uncover new leads, track down prospects, and secure the appointments, phone calls and key conversations that allow your sales team to succeed. What was once primarily cold calling, has now developed into sending emails, reaching out on social media, constant Linkedin monitoring, and using the expanse of the internet’s digital tools to put your products and services in front of the people who matter most. In recent years it has become clear that this is a skill in itself, and deserves the full attention of a dedicated lead generator, not the occasional attempt by a first-and-foremost salesperson. But Why Even Bother Splitting? “Ah, but what if my sales team are different? What if my sales team have mastered the art of effective lead generation and closing sales?”, you’re wondering. Simply put, your team are definitely not doing both jobs to the best of their ability. This is not just a case of being a good multitasker, this is a doctor also trying to run the surgery reception desk. Yes, the doctor can do both, but he cannot do both well. Motivation is low — Those who are good at sales may hate to reach out to potential new clients and therefore will try to avoid it at all costs. There’s no focus — As soon as your salespeople bring in those new leads, they will inevitably become too busy to continue prospecting. Alternatively, they will spend so much time trying to fulfil their pipeline quota that they will neglect to sell. Lack of training — You could hire the best salesperson on the planet, but if you have not trained them in how to effectively generate leads, they will lack the knowledge they need to create goals and manage this alongside their sales workload. There’s no time to analyse the data — When your sales team are busy selling and generating leads at the same time, there’s almost no time left to keep track of relevant data, such as analysing inbound leads, conversion rates, and so on. Having a separate lead generation team means giving the data over to those who actually have the time and know-how to not only analyse it, but implement a strategy based on it too. Issues are not resolved — When you have too much on your plate, it can be difficult to see the bigger picture, pinpoint where you’re lacking in your abilities and take action to fix the problem. Instead, you are caught in a constant cycle of trying to make yourself better by working more. An outbound emailing strategy accommodates splitting your sales team more than traditional outbound methods. 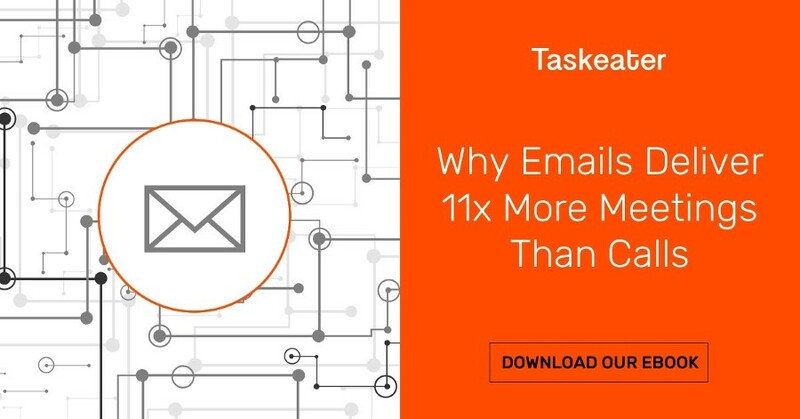 Download our e-book ‘Outbound Strategy: Why Emails Deliver 11x More Meetings Than Calls’ and read more here. If like me you are experienced with the drawn-out process of prospecting your own leads I am confident some of the above has struck home. It is key your restructure with the fundamental split between the act of prospecting and the act of selling in mind. Diluting the effectiveness of your current sales team is never the answer when looking to shake up their strategy. Instead, focus on moulding a sales team and a team of lead generators. Inbound Lead Qualification — Otherwise known as your market response reps. These are the people who qualify any marketing leads that come through your website or by phone. These leads could discover you through marketing programs, search engine marketing or simply organic word-of-mouth. Outbound Prospecting — Your sales development reps or new business development reps. These are the people who source lists of potential customers/clients, and ‘cold call’ them to set up a conversation. This team is dedicated to proactive business development, and source the right contacts to pass along to the salespeople, who will then go on to close the sale. Account Executives/Salespeople — These are team members who close the sale with a client. They will stay a part of the process until the new customer is up and running with the product or service that they have been sold, and will then pass this client along to the Account Manager. Account Managers — These are the people who keep the customers happy long term, providing ongoing client management, renewal of contracts and generally being there to provide the service that the salesperson would likely have promised the client during negotiations. This is something we have tried and tested at Taskeater, both with ourselves (growing to over 300 employees globally in just 3 years) and over 200 international clients. You can read more specifically how we help here. So, what can you do to make your sales team more effective? If you are reluctant to split up your in-house team outsourcing lead generation could be a solution. Outsourcing your outbound marketing can often be more effective than hiring lead generators in-house, as it removes those unnecessary tasks from your team’s to-do list and frees them up to do what they do best, without introducing and training new team members. This is key to Taskeater philosophy. Our business is built on the basis of saving teams time and increasing efficiency. This isn’t just about prospecting, we take on any time consuming, manual process on behalf of our clients to help their internal processes run smoothly. Read about what Taskeater could do to help your business here. Happy to answer any outbound queries personally on LinkedIn as well. Managing Director of Taskeater and one of Taskeater's former clients. He has 16 years of sales experience, two boys and loves rugby.